The loop is either ridden several times or as part of a longer route. No support, no government designation, and no governing body to create it. The Booty Loop has simply become a defacto training loop for cyclists all over the Queen City. The three-mile course running through the heart of the beautiful Myers Park neighborhood is the site of the hugely popular 24 Hours of Booty ride and, at times, sees more bike than car traffic. Deep in the heart of South Charlotte, near the scenic Freedom Park and Queens University, exists a rabbit’s warren-like confluence of magical streets. Here, the roads change names right before your eyes. You can even stand on a corner where both streets have the same name. But there’s something even more magical about the historic, oak tree-canopied neighborhood of Myers Park. Somehow, with no designated facilities or organizing body, a 3 mile (2.97 mile actually) loop of roads has emerged as one of the premier places to cycle in all of Charlotte. Cruising past Tudor, colonial revival, and bungalow style homes, the loop offers a glimpse into Charlotte’s past and a tour of one of the most pleasant areas of the Queen City. Whether they themselves are cyclists, they respect people getting fit, or out of shear resignation, the residents of Myers Park typically give way to riders, making this one of the safer areas to train. On any given day you’ll be joined by everything with two wheels and a couple peddles. 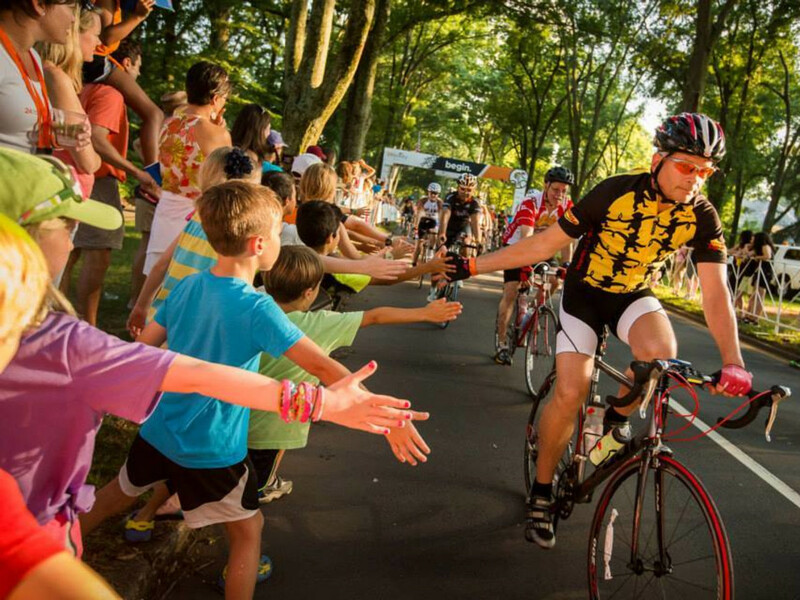 Every year the 24 hours of booty brings thousands of cyclists and volunteers to travel this loop over and over again. 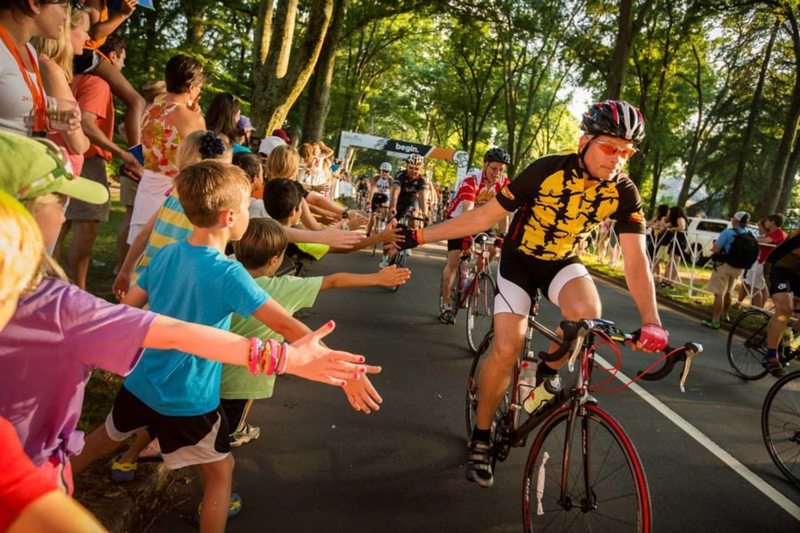 The event is a highlight in the Charlotte biking community and has raised millions of dollars in the fight against cancer. Experienced cyclists, often riding in packs, fly through these streets either completing several loops or as part of a longer ride. As it’s a loop, with plenty of opportunities to stop, new riders will take to the Booty Loop for an afternoon ride as well. Some riders start at Freedom Park but many use the lot at the Meyers Park Church on the corner of Queens and Providence. There's plenty of space here except during church services on Sunday. Beginning here go left from the lot heading South on Queens Rd. Take a right onto queens Rd west and follow it as it bends right and then right again. Complete the loop by turning right onto Hopedale Rd and you’re back to the finish (or the beginning). While most motorists in the area get along well with riders and runners, it's important to keep the right safety gear. A helmet and plenty of reflective clothing/lights will help keep everyone safe.